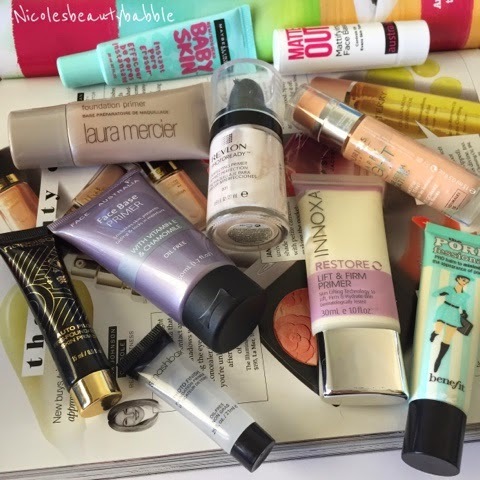 Nicole's Beauty Babble: Prime time! As you can see I have tried a lot of different primers, to try and find that miracle product that will stop me getting oily during the day. Unfortunately I cannot seem to find that product so I am just going to talk about a few of the stand out primers to me that I believe have actually aided in keeping my makeup on and helped reduce the amount of oil I produce during the day. So out of all the primers I have narrowed it down to 10 that I think have helped with keeping my makeup on my face, reduced the oil and make a good canvas for my makeup application. Maybelline Baby Skin - I find this primer very similar to the Benefit Pore Fessional and it does the same job for less of the price. Australis Matte Out - A great primer for us oily girls, this little stick helps keep my oil at bay and generally use this with my Laura Mercier or Revlon primer, I just put this over the top in my t zone and I find this is a great combo for my skin. Laura Mercier Foundation Primer - This primer would have to be one of my favourites, I love the way it goes on and how it helps to keep my makeup on during the day. Revlon Photoready Perfecting Primer - Another favorite of mine it creates a great base, keeps my makeup put all day and I believe it reduces some of my oil during the day. Bourjois Happy Light Matte Serum Foundation - This primer doesn't do much in the way of filling any pores but it helps keep my makeup on and aids a little bit with my oiliness. Napoleon Auto Pilot - A great base that creates a good canvas for your makeup & keeps your makeup on. Smashbox Photo Finish Foundation Primer - I actually hate the feel of this stuff but it works beautifully. It's an all rounder as it creates a good base, keeps your makeup on and reduces oil. Face of Australia Face Base Primer - Goes on great and you can apply your makeup on and it will stick around. I still get oily with this primer and it doesn't fill in any pores. Innoxa Restore Lift & Firm Primer - I do really like this primer it makes a nice base, keeps some oil away and my makeup is still on my face at the end of the day. Benefit The Pore Fessional - A very hyped about product from a lot of beauty gurus on YouTube is this little tube. I do like this primer but I do have a couple of other primers that I love more. It has that rubbery sort of texture that I hate but I do believe this fills in my pores for a great canvas for my makeup and it helps everything stick around. These 10 primers is what I would usually rotate around on a day to day bases. I haven't found anything so far that completely keeps my oily t zone away during the day unfortunately. I do also always apply a setting spray at the end of my makeup application. If you have a primer you think I should try out please let me know or let me know in the comments what your favourite is. It's like primer heaven haha! I use the baby skin and don't see me changing anytime soon. I love it and it seems to do the job at a reasonable price :D Great post. I love pore professional so much! Will have to try Laura Mercier! 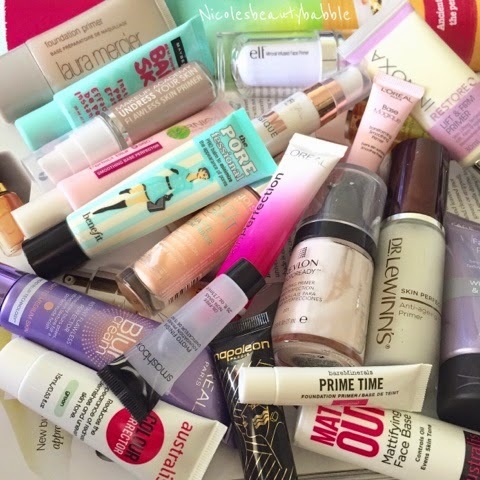 I need to try the revlon and smashbox primers!! Have you ever tried hourglass veil? I think you would love it! !